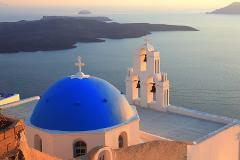 Santorini, the amazing Greek island has a lot to be seen, So we are taking you on a private tour through Santorini to Show you Santorini's most popular attractions you must see. We will start by picking you up then hitting the route to the island of caldera pose for pictures against the backdrop of the Aegean Sea. Then continue to check out the dramatic-looking black-sand beach of Perissa - the longest black beach on the island, and we can't miss the peak of Prophet Elias mountain, and testing samples of the dessert wine, honey and extra virgin olive oil that's made on traditional Santorini winery plus the local "Assyrtiko" wine which made by local family live in a farm. Group of up to 3 People: 400.00 Euros total, all included. Group of up to 8 People: 500.00 Euros total, all included. Group of up to 16 People: 1000.00 Euros total, all included. Food and drinks unless specified. "I travelled to Santorini with my best friend Lane but with no previous plans, I saw Visit & GO website and booked this tour from it. We get a really nice time despite that it can be shorter than this. "